Estimating the time of death of a married male. Often if a woman is widowed this will be indicated in the directory, so by searching several consecutive years of directories an estimated year of death can be made for her spouse. Finding the name of working older children or relatives. If one notes the addresses of all people of a surname in a directory the people living at the address most likely are related. By looking in the street directory for you ancestor's address you may find another family living with him. This could be be a clue to an in-law. Using the street directory to find a difficult ancestor to locate in the census. By looking up a neighbor' name in the census you may find your ancestor living next door with a "butchered census name". I used a similar approach to find my Madigan on Staten Island. When I found the family it was listed as Madison. Did you ancestor have a mid career job change? Their occupation is usually listed in the directory. Their occupation may also provide other sources to check for clues, see Professional directories below. Did your ancestor have a local business? If so there may be an ad for the business listing information such as the number of years in business or an image of the shop. As a substitute for the missing 1890 census. Credit Directories When one thinks about Mercantile credit reporting for businesses the name which often pops into mind is Dun & Bradstreet Inc. which was formed in 1933 from a merger between R.G. Dun & Company and Bradstreet Company. Both of these firms can trace their roots back to the 1840's. Bradstreet popularized the use of credit ratings with publication of the first book of commercial ratings circa 1851. As a competitor, Dun also issued credit reports on companies. These reports would estimate the credit worthiness of businesses. Besides national firms there are also local agencies by town, county or region (e.g. central Illinois) which reported credit information. The local reports are rather difficult to find. I have carried one in the 25 years of selling books. In 1924 he was most likely living in the vicinity of Charleston. This provides a place of residency in the years between census returns. I have a couple instances in my family where a family was recorded in the same county for two consecutive census returns, giving the impression they had stayed in one place. Upon researching one of the families it was discovered they lived in another state for about 7 years between the two census returns. The occupation is listed which could lead to records in a trade organization. By comparing his listing to others in the same trade an estimate of how he compared with his competitors can be made. It turns out of the other 16 Grocers in town 7 had a higher rating. In looking at the 1930 census for Charleston Amxy no longer had his Grocery store but was a manager for another business. Not for the Amyx case but the listings can give other possible names in families. In looking at the pdf file below 4 listings for the Mitchell name can be found. Of course the relation is not given but it does provide another research path to follow. One item should be noted is that credit directories do not cover a huge percentage of the population of an area. In the following pdf file all the information for Charleston Illinois was extracted. In 1924 the town had a population of ca 6600 people and 140 people (2%) were included in the directory. Sample pages from a Dun directory. The entry for Frank Coflin is the other extreme and lists only state & year of his birth, father's name, and address with occupation. Besides the alumni information the Illinois book also includes sections of the annals of the University, bios of faculty, honorary alumni and trustees, geographical index and alphabetical index. The annals section is a brief history of the school listing highlights with some names. Not mentioned above but the bios also may include date & place of death. Sample pages from various Alumni directories. (Amherst College 1883, Univ. of IL 1906, Univ. Chicago 1910, Troy State Univ 1980). County Directories In purchasing books I have encountered three main types of county directories. In the late 19th century starting around the time of the US centennial there was an up tick in the publication of county histories. 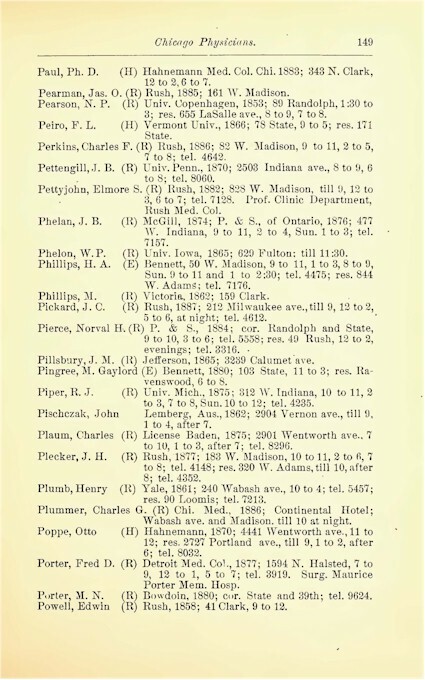 The format of the histories varied depending on the publisher but in the midwest a common feature of some of the histories was a directory section. 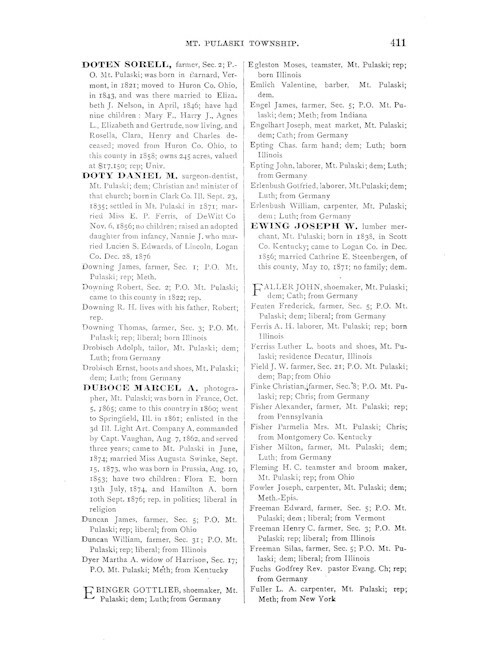 For example the following three county histories from supposedly different publishers were published in 1877-78 and a major portion of the book was the directory section. Note I say supposedly because a examination of the layout of county histories from this time period shows large similarities between books from different publishers. This similarity could be explain by publishers borrowing ideas from competitors or a quick name change to stay one step ahead of creditors. The publishers were for profit enterprises and they made their money by either selling a book or by selling an expanded entry in the directory section to a county resident. To the right is a page from the Logan county directory. As can be noted from the page most of the entries are two lines long with a few exceptions (Doty or Doten) where the name is in bold and more information is given for the resident. The two line listings were the standard listings and were free. The standard listing usually included name, occupation, political & religious affiliation and where born or lived prior. To have a larger listing the county resident paid a fee to have their information included in the book. This information will vary depending on what the buyer wishes to share. Often the names in these directories were obtained from records found in the local courthouse such as taxpayers or voters rolls. If a resident did not own property or had not voted in the past election they may have been excluded from the book. To examine the completeness of coverage the 1878 Logan Co directory was compared to the 1880 Logan Co. census. Of the men over 21 (not head of households) and heads of households (both male & female) in the Lake Fork township census only 40% of them appeared in the directory. Searching an electronic version of the book for a sampling of the names none of the men listed in the census but not in Lake Fork township part of the directory was found anywhere in the directory. To see if rural vs city reporting was any different a random page sampling of 6 census pages for the city of Lincoln showed about 50% of the names found in the census was not listed in the directory. When the census of the Lake Fork township was compared with the 77 listings found in the directory for Lake Fork township, only 42 of the 77 (55%) names listed in the directory were found in Lake Fork Township census. A search of the entire county census for a sampling of the missing names (names which would less likely to be misspelled) resulted in about 1//2 the names being found listed in another township. It is important to keep in mind how information is collected. The information found in these directories will exclude non property holders & non voters. For Logan county this means about 45% of the head of households do not show up in the directory. This number may be off by due to the two year difference in the census & directory and people coming & going in those two years but I doubt it if it is more than 15-20%. Also if your ancestor was a rural landowners their township of residence may be listed wrong. Many of them would include anywhere from 1 to 4 of the topics listed below. Year they came to the county. If they were born in the county this would be their year of birth. For example from the Coles Co directory we see that J.O. Eubank was married to a Estella Bennett and had children, William, Guinver, Palmer and Maxine. He came to the county in 1904 and tennent farmed 40 acres of land in Hutton township belonging to Esther Bennett. He also drives a Ford car. A little digging in the census shows John Oliver Eubank was born and living in VA in 1900. His wife was the daughter of Melvin & Esta Bennett. It appears Eubank was farming his mother-in-laws land. There were no other Eubanks in the county but 10 Bennett families with 3 in the same township as Eubanks. J.W. Fraizer was married to Frances Damern and had two children, John and Virginia. He came to county in 1880 (year of his birth). He owned and farmed 134 acres in section 35 of Seven Hickory Township. He raised Barred Plymouth Rock hens and drove a Reo Six. There were no other Damerns in the book and two other Fraizer families on the other side of the county. Every so so often publisher of a city directory will extend the scope of a work and include the residents of the entire county. In 1935 a directory was published listing all the rural households of Mercer county IL. This differs from the farm directory in that rural residents who were not farmers were also listed. The data was similar to the farmer directory in providing maiden name of spouse and children. Some city directories also covered the entire county. The 1928 city directory for Champaign Urbana has the names of the residents of the small villages included in the main directory section. There is an additional section which includes the names of the rural residents. Professional (Occupational) Directories If your ancestor had a professional occupation such as a doctor, lawyer or an educator they may show in a professional directory. If the profession had a national, state or local organization there may exist a directory of the organization. Besides having a list of members the directory will often be filled with ads. If your ancestor sold or manufactured items for a specific profession their ads may be found in the book. The contents of the directory listings will vary. For example in the following directories you can find the noted information. The first national medical was published in 1906 by the American Medical Society. Subsequent volumes were published every three years. Prior to 1906 medical doctors & druggists can be found listed in state and local medical society directories. American Medical Directory, 1906 - year of birth, medical school, year of graduation, year of license, military service and society membership. The Medical & Surgical Directory of Cook County, Illinois, 1888 - For doctors this will list the place & year in which they received their medical degree and their address with hours of service. For druggist only a name and address is provided. The Annual Medical Directory of Regular Physicians in the State of Illinois, 1878. This volume has an alphabetical listing of the towns in the state with the name of doctors and when & where they received their degree. There is also a cross index by physcians name. The format of both books were similar and consisted of ads, listings of laws and the directory section which contained a lists of lawyers by geographical area. Often the only information provided was their name. At the same time regional directories covering a city or state were also published. Directories in education will fall into one of two types. They will either be published by the institution of by a governmental unit covering a city, county or state. An example of the first type would be Catalogue of the Officers and Students in Illinois College in 1835-36. This provides only the names for five faculty members and the list of trustees. Also the book lists current students and their hometown. After 100 years the format of the directories had not changed much. A 1936 directory for University of Illinois lists both faculty & students and provides the street address for their residence. These publications will be published every year so a search of series of the publications will provide a timeline in which an ancestor was employed by a particular institution. Sometimes the directory wil list where the person received their degrees. An example of directories for governmental units would be Board of Education for City of Chicago, 1909. This provides a list of all teachers, the school where they taught and their home address. In addition there are lists of supereminent, principals and committee members. Another directory by a governmental unit is Professional directory of administrators and teachers in accredited high schools of Kansas (1912) provides name, year & where received degree, subjects taught and name of school. The following illustrate a small sample of what other types of directories are avaliable. Directory of business and professional women in Richmond, Virginia, 1921 provides a list of business women by type of business and provides their business address. 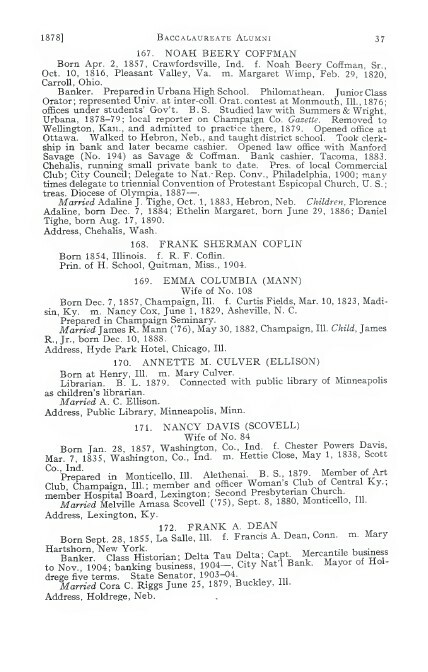 Sample pages from various professional directories.